There are many different directions you could take your career in, with opportunities to explore a diverse range of businesses along the way. Progression is a constant possibility (40% of our 2017 hires were internal moves). We also provide support for professional qualifications. This department is the place for people who are good with numbers and spreadsheets, and can always understand what the data is telling them. For more senior roles, business partnering skills are important. Everyone here is passionate about what they do. 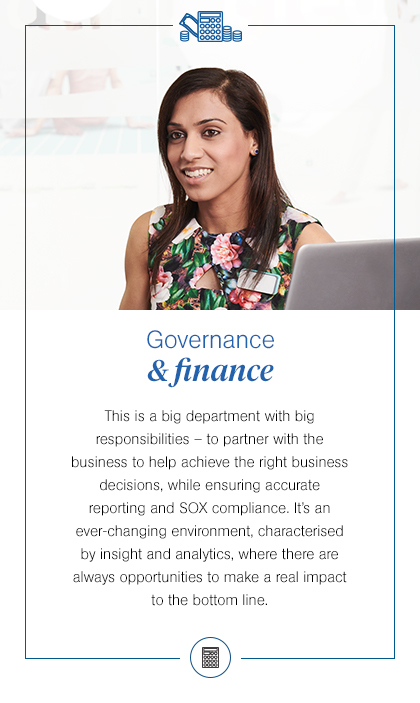 Explore our Governance and Finance teams to see where you fit in. Dedicated to understanding and reporting on our financial performance, with a focus on improving the profitability of our retail estate, online and public sector channels. Responsible for transactional finance activities, which includes processing and accounting all cash receipts from customers and payments made to suppliers. Provides independent assurance that our risk management, governance and internal control processes are all operating effectively. Provides expert advice and assistance across the business in the areas of legal, compliance, company secretariat and data protection. Takes care of master data quality and delivery for our AAH and LloydsPharmacy sales channels. This includes product, price, promotion, supplier and customer records. Handles any works across our estate, such as refits, relocations, shopfitting and asset management. Also looks after all maintenance issues and is involved in acquisitions and divestments.